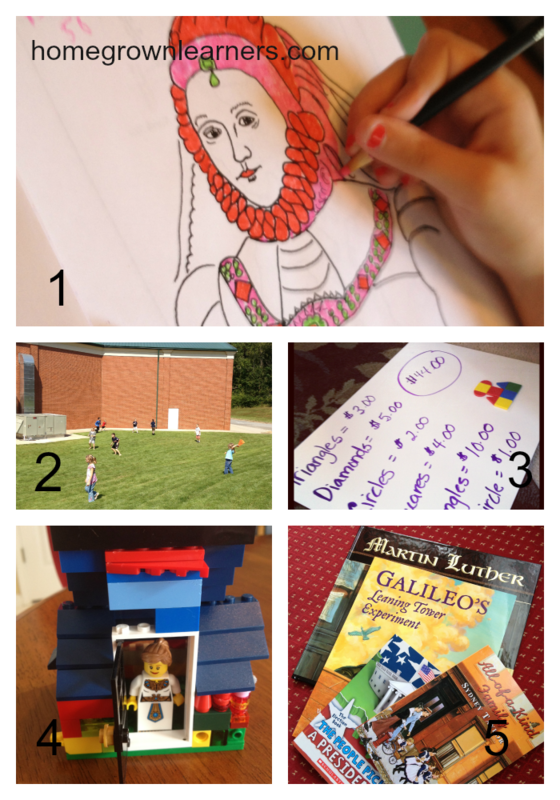 We've completed week 8 of our homeschool year. It was another great week of Classical studies, paired with a healthy dose of Interest Led Learning as well. The kids are going strong with their studies, children's chorus, piano lessons, and baseball. We are busy, but it's a happy and productive busy. I'm so thankful for the many opportunities in our path this year. Grant has started keeping an animal notebook. Each time we visit the library he checks out a book about a different book and "takes notes". I love the self-motivation, but this past week it got out of hand! He and Anna started getting it in their heads that they wanted gerbils. This then turned into a guinea pig. 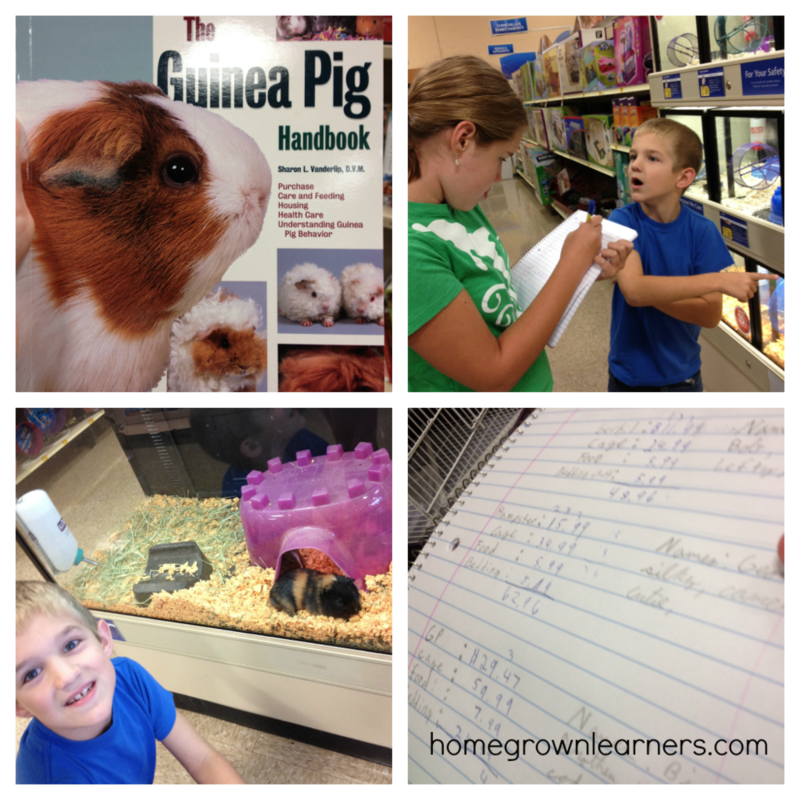 They bombarded me with a fresh notebook and all of the information they wanted to learn on an outing to the pet store so they could convince their dad we should get a guineau pig. I am not dumb. I milked this for all it was worth. I said sure I would take them to the pet store, if they finished their work nicely and helped me clean the entire downstairs! Well, those little stinkers did it (and cheerfully, I might add), so I owed them a trip to the pet store. I am not a huge pet person. I love our sweet little dog, but I think that's my limit. We did have fun with Harry (the hermit crab) last year, but he was dead after six months. I'm just not so sure we have the commitment to care for other creatures in our home! 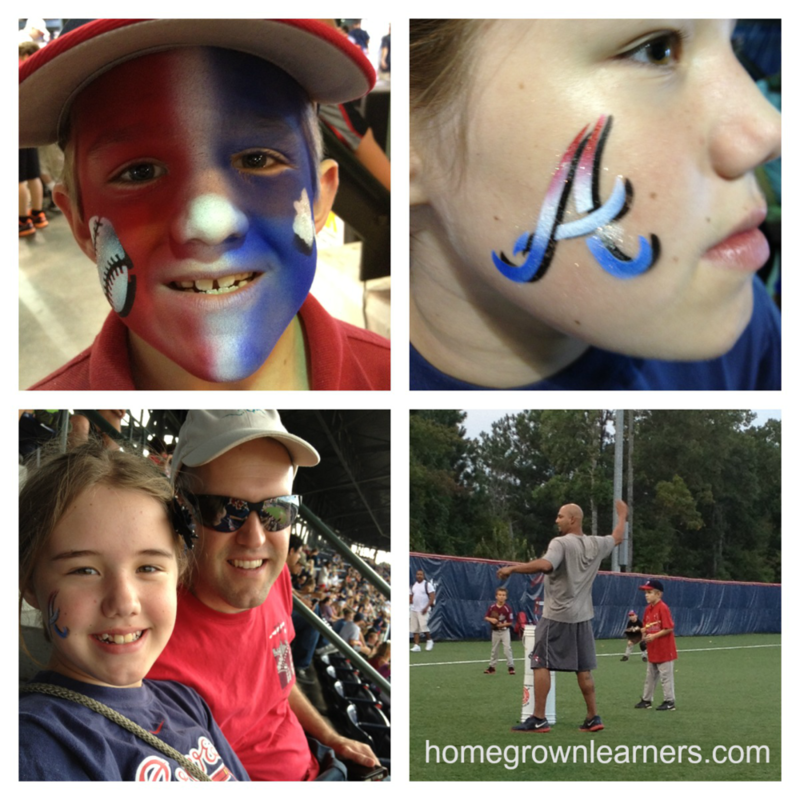 We enjoyed our last Atlanta Braves game of the season. The kids both got their faces painted and you have thought it was Christmas. Their goal was to get on the jumbotron (which never happened), but they had fun trying. It was a great game and we beat the Nationals 5-4. Grant is also loving playing fall ball at a local baseball academy. He's learning a lot and the standards are high. At the last practice the boys had to run laps if they did a drill wrong (which was usually a result of not listening). The boys were running laps left and right. 1. Each time we sit down with a lesson from The Story of the World I am more convicted that this is the history program for us! (I vlogged about How We Use The Story of the World if you want to know more.) This week we learned about Renaissance Scientists and also about Queen Elizabeth. Anna got out the watercolor pencils and spent a lot of time working on Queen Elizabeth's portrait while I read the chapter aloud. We're also reading Who Was Queen Elizabeth to learn more about her. 2. This was Week 3 of our Co-Op. Each week the children play before and after classes in a big grassy area outside of the church. It struck me as I watched them how blessed my children are to have these friendships. I've had a couple of negative comments about homeschool this week from neighbors and friends and it was nice to be around like-minded families for the afternoon. 3. More tangrams this week! This time we assigned a dollar amount to the different shapes, and then Grant had to construct a large figure that was a specific dollar amount. He spent at least two full hours doing this. So simple... some tangrams and a white board. Over the past two weeks we've been pulling out the tangrams a lot! 4. LEGO Learning with Polyanna - yes, that's right Polyanna. One of the selections in Writing With Ease Volume 1 was Polyanna. Anna wanted to read the book so she read it (and enjoyed it very much) on her Kindle. We checked out the Disney movie (which she said was NOTHING like the book - but still good) and the kids watched it one rainy afternoon. They both sat in front of the tv with the LEGO buckets building scenes from the movie. The picture is apparently Aunt Polly in her house. We packed A LOT OF LEARNING into one week. I always say this, but I'm so grateful we are learning this way and learning together. Despite some hard days, I wouldn't have it any other way. I am excited to a member of the iHomeschool Network's team of bloggers for Samaritan's Purse. Have you started packing your shoeboxes yet? Read Serving Others Through a Shoebox. Irrational (but Understandable) Homeschool Fears - Part I - This was a popular post, and I was inspired to write it because of the many moms I know who are "sitting on the homeschool fence". Part II will be out next Tuesday. SQUILT Lesson 2 was posted. Are you doing music study in your homeschool? There's no reason you should be since I am giving you free lessons and a notebooking page! Hop to it! Don't miss a blog post! Have you subscribed to Homegrown Learners via email? When did it become acceptable for people to say every single thing that is on their mind (particularly on Facebook)? The level of offensive political discourse is disturbing to me. I have had to unfriend a few people because I am seeing a side of them I do not like. No political candidate is more important than a relationship with a friend or family member, and it saddens me to see so much political commentary (many times it is uninformed commentary, too!) when I log onto Facebook. Recently a "friend" kept posting anti-homeschool articles and veiled status updates against homeschooling. My children and husband are TOO IMPORTANT TO ME for me to take my precious time and engage in a debate I will never win. It is even too precious for me to waste a minute reading garbage and fretting about it. I wonder how people have so much time to post updates like this on Facebook. It is amazing to me that people think they have the right to comment so publicly on other's private decisions. In the end - will anyone's mind be swayed by a Facebook post? I doubt it. I need to ask myself if each and every word I type is God-honoring... if it is, then I'm good. There, I'm done. Do you feel the same way? How was your week? Please link up your homeschool collages. Grab a button or text link back to this post, then please visit other bloggers in the linky to show support and gain ideas. I love the weekends because I get to catch up with all of my blogging friends and what they are doing with their children!